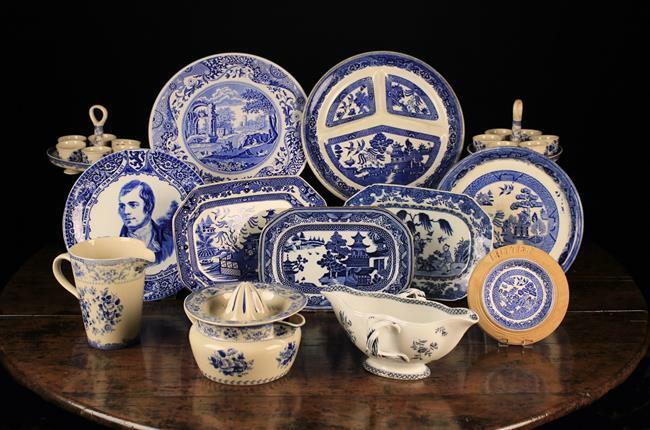 A Collection of Various Blue & White Transfer Printed Ceramics to include: a willow pattern low footed comport, three small platters, a willow pattern hors d'oeuvres plate, a group of Powell-Craft Cuddra collection kitchen pottery; a citrus juicer with jug, 700 ml measuring jug, a pair of eggcup sets with six cups each on a pedestal stand. Also a Mintons twin-lipped sauce boat. 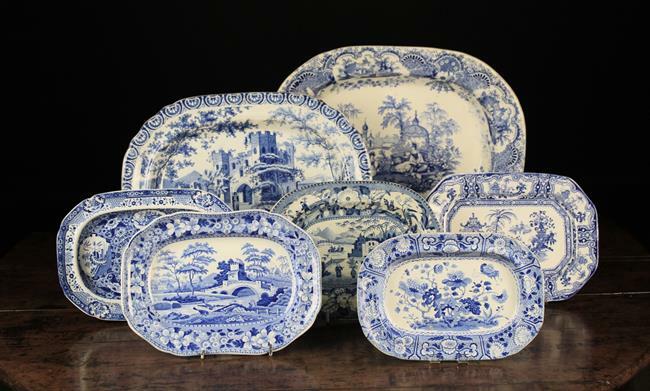 A Group of Seven Decorative Blue & White Transfer Printed Plates: A small Spode 'India' pattern plate circa 1815, 9¼ in x 6½ in (23.5 cm x 16.5 cm). A Spode 'Tower' plate circa 1820, 10¼ in x 7½ in (26 cm x 19 cm). A Spode 'Net' pattern plate circa 1820, 10¼ in x 7¼ in (26 cm x 18 cm). An Adams ironstone 'Kyber' pattern plate Circa 1920, 7¼ in x 10 in (18.5 cm x 25.5 cm). A oriental scene with vignettes and flowers to the border, circa 1840, 7¾ in x 10¼ in (19.5 cm x 26 cm). A meatplate with figures, cattle and castle in landscape 11½ in x 14¾ in (29 cm x 37.5 cm). And a meatplate with figures on landscape and scenic vignettes to the border 16 in x 12¼ in (41 cm x 31 cm). 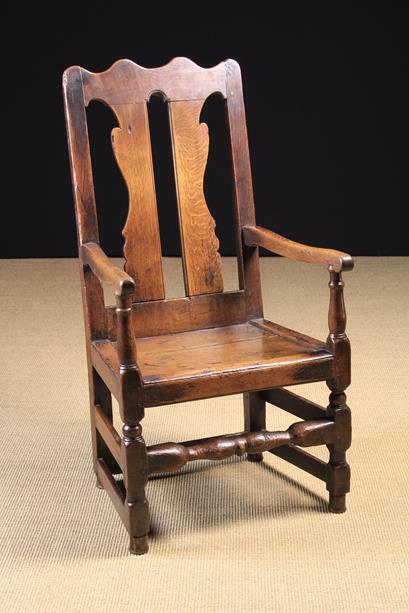 An 18th Century Joined Oak Armchair. The wavy humped top rail above two shaped splats flanked by plain uprights. The arms on baluster turned supports leading down to a plank seat in a raised frame standing on ball & block legs united by a twinned baluster front stretchers and plain rails to the rear and sides, 42 ins (107 cm) high, 22 ins (56 cm) wide. 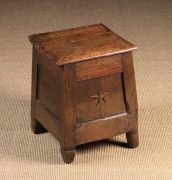 A 19th Century Rustic Candlestand. 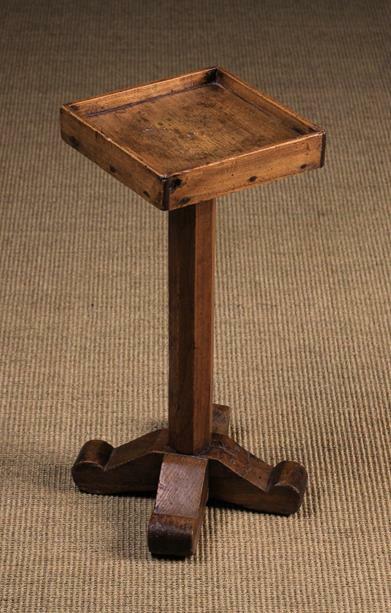 The near square tray top with applied edge rails, fixed to an octangular post leading down to a cruciform base with scroll terminals, The top 8½ in x 8¾ in (21.5 cms x 22 cm), 20½ in (52 cm) high. 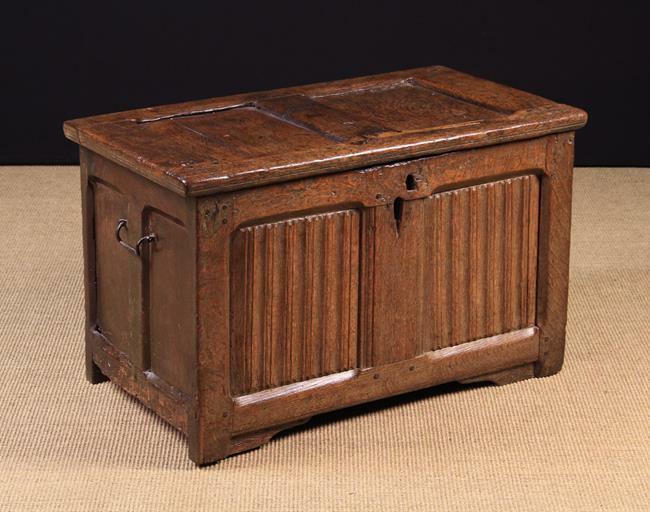 A 16th Century Flemish Twin Panelled Oak Coffer with vertical ripple carving to the front panels, a chamfered framework, iron loop hinges and swing carrying handles either side, 19¾ in (50 cm) high, 32¼ in (82 cm) wide, 18½ in (47 cm) deep. A Wrought Iron Standard Lantern Lamp. The conical topped lantern on a wrythen stem with cruciform base 59 in (150 cm) in height. An 18th Century Joined Oak Box Stool with hinged lid above splayed panel sides inlaid with a marquetry star to the front and raised on tapered block feet17 ins (43 cm) high, 13½ ins (34 cm) wide, 12½ ins (32 cm) deep. 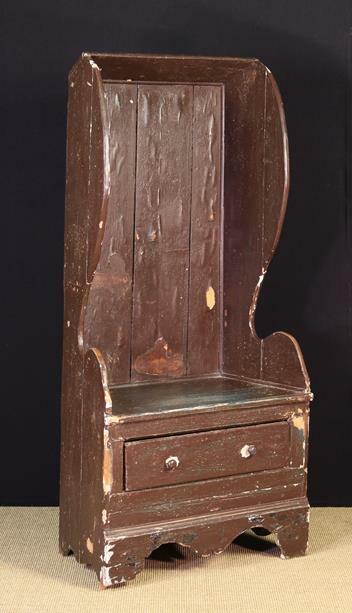 A Small Painted Pine Box-seat Settle. 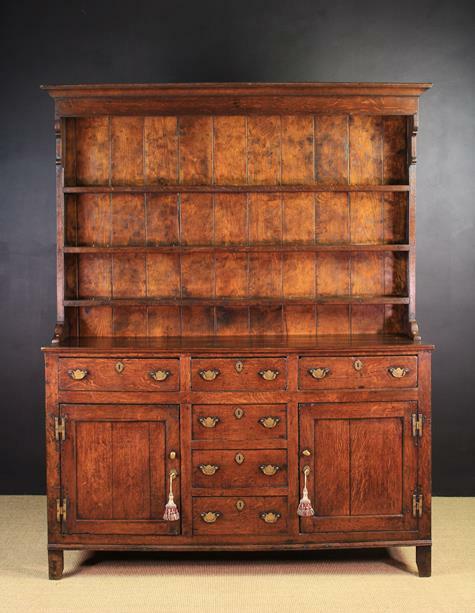 The tall planked back with angled canopy rail to the top and splayed shaped side boards leading down to a splayed seat above an enclosed base on bracket feet housing a single drawer with brass knob handles, 64½ in (164 cm) high, 30 in (76 cms) wide, 18½ in (47 cm) deep. 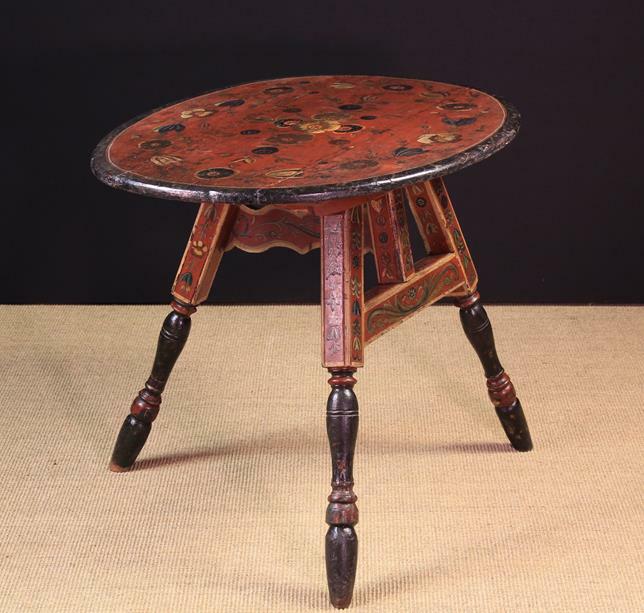 A Charming 19th Century Painted Folk Art Folding Table. 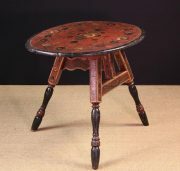 The planked oval top naively decorated with flowers on a red lead ground with black border, standing on a floral painted folding base with turned baluster legs composed of an A-frame and pivoting gate with serpentine cut cross bar and a pegged block support to the top. 28½ in (72 cm) high, 36 in x 27½ in (90 cm x 70 cm).